The Champion Motorsports iRacing Endurance e-sports Team has just finished another very successful week , this time at Limerock Park. For this week we would enter all four of our cars in the races this weekend, and the Omega Car would again lead the way with a team high 9th place overall finish. Directly behind was the Beta car with a 10th place Finish. The Alpha car would finish 12th in the Sunday Split and all three of these cars would score very strongly with over 90+ points each in the Championship Race. The Gamma car would also run as high as 13th before an accident would drop it to 21st of 50 in the final standings for the week. After 6 Rounds we have some strong results to share. The Alpha car currently sits 18th with the Omega Car 30th and the Beta Car 33rd, out of over 300 team cars entered. Next week we will be at Road America in another great race, and familiar venue! Video of stream, primarily from Gamma Car View, but some focus on progress of other teams. Tour de Corse 2019 highlights are in for the CMS Rallye Time on Rallyesim.com with Richard Burns Rally! Check out and enjoy as the team continues to do some great things rallying across the world in these great, comprehensive and immersive rallies! The Champion Motorsports esports rFactor 2 team just recently came back from Virtual UK as they competed in the P1 Gaming 8 Hours of Silverstone. This was the 2nd event for the young team and another great learning experience with some solid gains and another race finish under their belts. The team has now been able to say that they have 20 live hours of full racing under their belts with a previous finish in the Suzuka 12 Hours Followed by this performance at the Silverstone 8 Hours. The driver lineup for Silverstone would consist of JT Tami, David Anderson and Vincent Marsh. Regular Matthew Overton would have to miss the race, and we will look forward to seeing him next time in Homestead Miami. Our focus leading up to the race was on racing and only racing, so it was not a surprise that JT Tami after qualifying would find us 23 of 25 on the Grid. This was short lived however, as JT did a marvelous job moving us up in the first stint into a points position. Things were looking really well until a pop up shower sprung at The Silverstone Circuit that we were not anticipating (lesson learned). This would cause some trouble for the team as most of us did not have many laps in wet weather prep and so it was learning on the fly. David Anderson would take over the car and manage to keep us going, before handing over to Vincent Marsh who did a great job trying to deal with a little bit of damage to the car and work us back up where he could. In the end, the finish was not what we had been hoping for, with 20th of 25 in the GTE Class, but it was a great day of learning and opportunity to continue to come together as a team and build upon our experiences. The team has shown resolve and will to finish the races and we are extremely confident the finishes we desire are not far away. We will next race on May 11th in the United States at Homestead Miami Speedway. Look for more updates from the team between now and then and if you are interested in joining us please let us know. CMS Cars Run Nose to Tail, Finish Great at Laguna Seca! 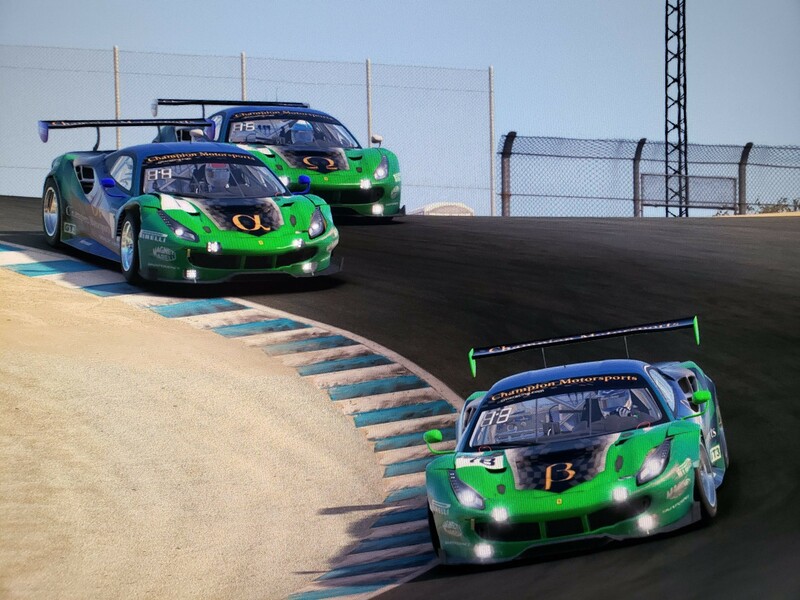 The Champion Motorsports Endurance Team has just completed another very successful week as three cars were taken and entered at Laguna Seca, and all three cars drove to a finish and solid result. For the third week in a row the Omega Car would lead the way, with an 8th place overall finish of 37 entries. Driven by James Andrew and Miguel Alcrudo the car was fast, consistent and hard to beat. A nearly flawless drive by both James and Miguel would be a team best on the day. Just behind the Omega car was the Alpha car driven by JT Tami and David Anderson also with a very solid finish in 12th place overall and very competitive after starting 24th on the grid. With the drive by JT and David the Alpha car is now a team leading 27th in overall points in the Championship, out of 300+ cars entered in the VRS GT3 Championship. This car is our primary focus to enter every week and it was great to see the car have another solid finish at Laguna Seca. Rounding out the finishes was the Beta car. This week driven by Paul Hamilton , Mike Tyler , and Jay Dargert. Paul Hamilton did a flawless start in the car and it actually would lead the way for the first hour of the race from the team stable. A little fall back afterwards did not prevent the car from a great finish in 18th overall and all three drivers were rock solid and very consistent. We also debuted new liveries this week for the team provided by Mike Tyler from the Beta car. Additionally most of the engineering and setup work for the overall team this week came out of the Beta stable with amazing efforts from Paul Hamilton and Jay Dargert. Next week we head to the East Coast for a race at Limerock Park and we are optimistic to be able to bring another strong field and hopefully up to all four cars competing. We are very excited about the final release of Assetto Corsa Competizione coming on 5/29/2019, and equally excited that our series to simulate the Blancpain 2019 season will commence here at CMS on Monday nights beginning June 3rd, 2019. Check out the release video and visit our ACC Monday Night league area on the forums to sign up for the new league here at CMS! All skill levels are welcome.